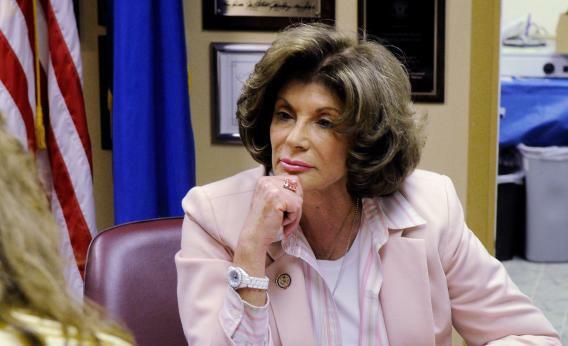 LAS VEGAS, NV - JANUARY 14: U.S. Rep. Shelley Berkley (D-NV) visits with constituents during a ‘Congress on the Corner’ event at Berkley’s district office January 14, 2011 in Las Vegas, Nevada. Berkley held the event to honor U.S. Rep. Gabrielle Giffords (D-AZ) who remains in critical condition after she was shot in the head while hosting her own meeting with constituents on January 8 in Tucson, Arizona. Today, President Obama laid out the clear choice Nevada voters have in this upcoming election. While the President and I share the same long-held commitment to building an economy that prioritizes the middle-class by creating good paying jobs that can’t be shipped overseas, making college more affordable, keeping families in their homes, protecting Medicare and Social Security, and delivering for our veterans, our opponents’ priorities couldn’t be different. Instead of looking out for the middle-class, Republicans like Senator Dean Heller and Mitt Romney continue to do things the Washington way - going to bat for Wall Street corporations, protecting taxpayer subsidies for Big Oil companies that don’t need taxpayer handouts, and standing up for private insurance company bureaucrats who want to turn Medicare over to private insurance companies. I look forward to working with President Obama in the months and years ahead to build an economy that works for all middle-class Nevada families - not just the special interests and Wall Street millionaires. It’s a safe bet that we won’t get statements like this one from many (or perhaps even any) other Democratic Senate contenders. For many of them, the president is a toxic figure to be avoided, their campaign strategy built on the assumption that they will outpoll Obama among white voters and run ahead of him in November. This applies to Senator Jon Tester in Montana, Senator Claire McCaskill in Missouri, and Democratic candidates like Joe Donnelly in Indiana and Heidi Heidkamp in North Dakota. But Berkley is the exception. Polls show Obama quite strong in the Silver State, whereas Berkley is stuck in a tie. Her strategy will be to latch on to the president at every opportunity, hoping some of the energy (and massive support from young and African American voters) behind his re-election bid rubs off on her own campaign.